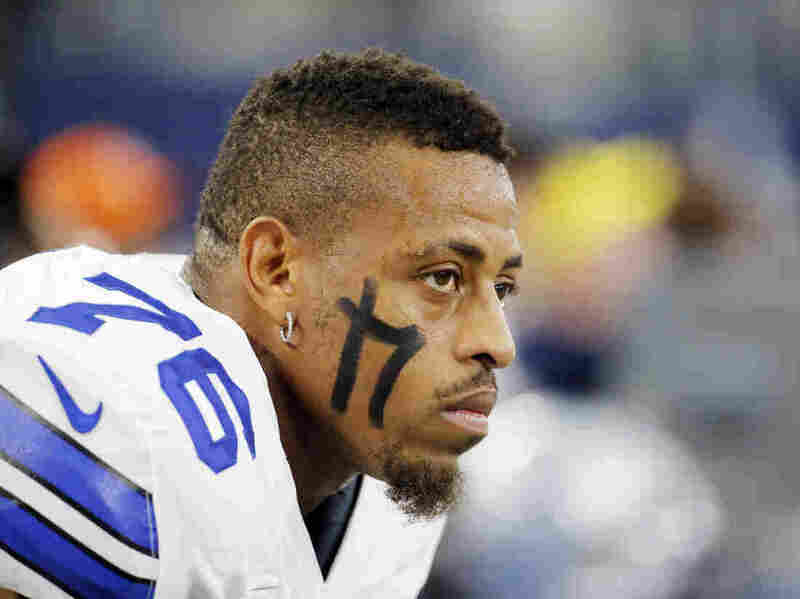 Photos Emerge Of A Woman's Injuries, Allegedly Inflicted By Cowboys' Greg Hardy : The Two-Way Deadspin published photos it says are of Nicole Holder's bruised body. Hardy was found guilty of assaulting her, but the conviction was thrown out. The photos have refocused attention on the attack. Dallas Cowboys defensive end Greg Hardy was arrested and charged with assaulting his former girlfriend Nicole Holder in May. He was found guilty but appealed, and then when Holder stopped cooperating, the case was dropped. Today Deadspin published 47 graphic photos of a woman's bruised body. The body belongs to Nicole Holder, the site says. The man who allegedly left the bruises? Dallas Cowboys star pass rusher Greg Hardy. The photos came to light Friday, a year and a half after Hardy was arrested and charged with assaulting Holder, his ex-girlfriend. He allegedly pushed her against a bathroom wall, threw her onto a couch containing several guns, and choked her. Hardy, who was then playing for the Carolina Panthers, was found guilty by bench trial last year, but he appealed and eventually the case was dropped when Holder stopped cooperating with the prosecutors. This week, a judge granted his request to have the incident expunged from his record. All in all, Hardy missed the 2014 season on the NFL's exempt list before signing a one-year, $11.3 million deal with the Cowboys in March of this year. The NFL suspended him for 10 games of the 2015 season, but the punishment was reduced to four games during arbitration. Last month Cowboys owner Jerry Jones called Hardy a "real leader." There was contained outrage among some NFL fans and from talking heads like Terry Bradshaw and Katie Nolan about the fact that Hardy was back playing in the NFL, but his strength and speed on the field soon dominated the conversation. Black and blue, red and swollen, the photos of Holder's battered body elicited a visceral reaction. Sports talk shows and social media exploded, shocked by the physical evidence. Shocked, but not surprised, because the previously known facts supported the conclusion Hardy had beaten Holder on that night in May last year. As the conversation progressed throughout the day, the same questions surfaced time and again: Why do we need these photos? If we knew Hardy had beaten Holder, what do these photos change? The answer, of course, is nothing. Nothing changes, and we shouldn't need these photos to know that a crime was committed. If it seems like this discussion has been had before, it's because it has. In February 2014, Baltimore Ravens running back Ray Rice was arrested for assaulting his then-fiancee, Janay Palmer. He was shown on surveillance video dragging her unconscious body out of a hotel elevator. The public outrage flared up and then died down. Over the course of the summer, Rice applied to a diversionary program for first-time offenders, publicly apologized and accepted a two-game suspension from the league. "The Rice video transformed the public response to the assault, but it was able to do so only because we knew that it hadn't transformed the assault itself. [NFL Commissioner] Roger Goodell, who extended Rice's suspension indefinitely after the tape's release, famously said that the video 'changed everything,' but it changed everything because it changed nothing. The tape was so powerful because it showed us that we shouldn't have needed a tape in the first place." Now the question is: With photos published, will anything change for Greg Hardy? So far, it doesn't look like it. He's still on the team, and ESPN reports both Hardy and the Cowboys declined to comment on the release of the pictures.